Adoption attorney cautions online advertising can be a "hotbed for scams"
(CNN) -- Their paths crossed on YouTube on an August night last year. Jeremy and Christy Nueman used YouTube to find their adopted baby, Caleb. Amanda, a college student seven months pregnant, scrolled past a YouTube video of a young California couple seeking adoption. 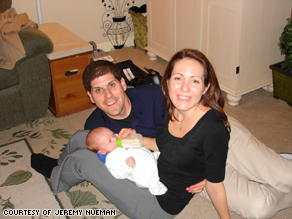 The couple, Jeremy and Christy Nueman, wanted to adopt a baby after struggling with infertility for five years. But instead of relying solely on newspaper ads or bulletin board fliers to increase their chances of connecting with a birth mother, they created a short YouTube video to show who they are. Upon watching the video online, Amanda immediately connected with a snapshot of the Nuemans' adorable miniature pinscher named Penny. She giggled when she saw video of Jeremy Nueman dancing happily in his kitchen, which reminded her of her own father. She played the video over and over again. "The video was comforting, and I could relate to them" said Amanda, who picked the Nuemans to become the adoptive parents of her baby boy out of hundreds of profiles she viewed online and through adoption agencies. Amanda chose to keep her last name anonymous for privacy reasons. "It's so hard when you are just reading a letter to figure out what are these people like." With a high demand for domestic infants, adoption experts say the wait for a baby can be months or years. To gain a competitive edge, a growing number of adoption-minded couples are using Web sites like YouTube and Facebook to sell themselves as parents. Going online is cheaper, faster and reaches a wider audience than using just on print advertisements and word of mouth, they say. Some wannabe parents are uploading YouTube videos featuring a hodgepodge of photos, home tours and interviews. Others are writing on blogs and personal Web sites to give birth mothers a glimpse of their adoption journey. To help spread the word, prospective parents also are utilizing social networking sites like Twitter, MySpace and Facebook in the hope that their friends may know of a potential birth mom. "Today's teens and young adults looking for adoptive parents are more tech savvy than before," says Jeff Siler, who owns ParentGallery.com, a free site created in 2007 where couples wanting to adopt can post pictures and video online. "Even before teens talk to an adoption agency, they may already be trying to Google for an answer online." Social media like YouTube, Twitter and Facebook are also gaining traction among private adoption agencies. Bethany Christian Services, one of the nation's largest adoption agencies, which completed more than 730 domestic infant adoptions last year, advises its couples -- including the Nuemans -- to create a YouTube video. "Having a video makes you feel like you are with them in person," says Dawn Baker, a social worker at Bethany Christian Services in Madison Heights, Michigan, who says the teen mothers she counsels really connect with the videos. Baker added that she matched a 16-year-old pregnant girl with a family in North Carolina after the teen saw their video last month. The adoption is not yet finalized. In the past, adoption advertising, which is allowed in at least 34 states, traditionally relied on newspaper and radio advertising as well as brochures, fliers and business cards, adoption experts said. In the digital era, these media no longer have the reach they once did. Newspaper ads can be costly, running hundreds of dollars a month. Maria Kwarta and her husband, Nathan Kwarta, both 26, of University City, Missouri, saw the Internet as a natural way to reach potential birth moms. "We were trying to do what was familiar to us. We already had Facebook and MySpace accounts, so why not just use that," said Maria Kwarta, who has been discussing adoption with her husband for more than five years. The two are also sending Tweets every few days, seeking potential moms on Craigslist, documenting their efforts in Live Journal, updating their Xanga profiles and posting on CafeMom. The Nuemans and Kwartas aren't alone in their relentless efforts to find a baby. While there is no federal data tracking the number of private domestic adoptions each year, adoption experts estimate that about 15,000 private domestic infant adoptions are completed in a year. Yet experts said the number of couples trying to adopt is even larger than the adoptions that are finalized. White American infants continue to be in the highest demand, adoption experts say, but the number of domestic infants available for private adoption has dropped as women have more access to contraception and the social stigma against single parenting has lessened. For example, from 1989 to 1995, the percentage of children born to never-married white women who were placed up for adoption dwindled to 1.7 percent, a steep decline from 19.3 percent of children going up for adoption before 1973, according to the Evan B. Donaldson Adoption Institute in Massachusetts, a nonprofit that tracks national adoption trends. "The more people who know you are looking, the better your prospects," explained Adam Pertman, executive director of the Evan B. Donaldson Adoption Institute, who has seen more prospective parents start using the Web to spread the word in the last few years. "It's a crapshoot, and you are trying to improve your odds." Seth Edlavitch, 38, and his wife had waited for a baby for nearly three years. They had made a paper flier to find a birth mother, and on a whim, they uploaded it to Facebook last December. His wife, Melissa Segal, 39, was unable to conceive and had a devastating miscarriage years before. It took only two weeks before a friend of a friend, who knew someone who wanted to give up her child for adoption, found the flier online. "It's just one of those right place and the right time situations," said Edlavitch, who brought their newborn son, Noah Edlavitch, to their Maryland home on New Year's Day. "I never would have anticipated that it would work the way that it did." There are some downsides to advertising online. Driving traffic to the site can be tough. The blogs, videos and profiles need to stand out to be effective, says Lori Dowd, who owns an adoption consulting Web site, ProfilesThatGetPicked.com. Karen Greenberg, president of the American Academy of Adoption Attorneys, a national association of adoption lawyers, warns that advertising on Craigslist and Facebook can be a "hotbed for scams." The academy is trying to create a national "adoption information clearing house" where attorneys, agencies and eventually couples looking to adopt can use the site to check the birth mother's status. The site is planned to be launched this year. "There aren't any regulations to oversee what's actually going on when you go at it alone," she said. Back in their home in San Diego, California, the Nuemans have celebrated their first Thanksgiving and Christmas with their new son, Caleb, a playful, chubby, brown-haired, blue-eyed baby. The adoption was finalized in October 2008. "I remember walking through the door with Caleb the first time we bought him back," said Christy Nueman, 29. "Just the thought that our family was going to be full-grown -- it was a sweet moment knowing this would be our new family." All About Facebook Inc. • Adoption • YouTube Inc.